All options include 1 year of free upgrades and 3 months of free support. 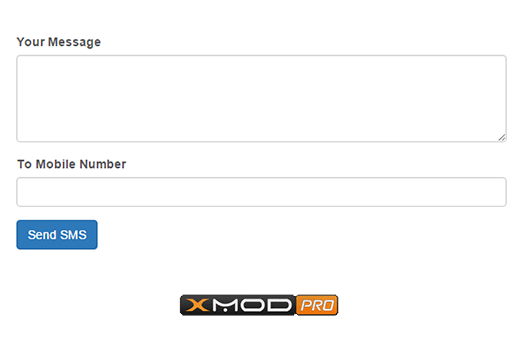 Send SMS/Text Messages with an XMod Pro Form using the Clickatell platform. Clickatell Custom Form Action is an extension for XMod Pro. Not simply a form builder, XMod Pro is the only complete application builder for DNN. It's so awesome, we even wrote a book on it, which teaches you how to build a complete solution from start to finish. You'll be building module solutions the same day! Read the documentation to review all of the features! Reflect Media Group specializes in custom website and module solutions. It is hereby understood and agreed that Reflect Media Group LLC ("Licensor") is the owner of all right title and interest to Clickatell Custom Form Action for XMod Pro ("Software") which you are about to purchase a license to use and download. You, as licensee ("Licensee") through your purchase of this license to use the software do not acquire any ownership rights to the Software. The Software which accompanies this license is the property of Licensor and is protected by copyright law. Licensor reserves the right to transfer it rights herein and ownership interest in the Software. In the event Licensor transfers its rights herein and ownership interest in the Software, such transfer shall not affect the rights and obligations of any party to this agreement and this agreement shall remain in full force affect. This is a license, not a transfer of title or ownership to the Software. In consideration of the payment of a license fee, Licensor hereby grants Licensee a nonexclusive license to use one copy of the Software on a single production website and an unlimited number of development websites. However, the websites the Software is used for, whether production or development, may only be used with a single DotNetNuke installation. For the purposes of this agreement, "development websites" are defined as a website or websites used solely for configuring, testing, and developing applications with the Software prior to installation of the Software on a production website for a single DotNetNuke installation. For the purposes of this agreement, a "production website" is defined as a website running a single DotNetNuke database, which may be either a public-facing web server or a private server running on an intranet. Under no circumstances may the Software be used on more than one DotNetNuke database without purchasing additional licenses. (2) Use the software on more than one DotNetNuke installation without purchasing additional licenses. A. This Agreement and the Limited Warranty shall be governed by the laws of Kentucky. B. All disputes hereunder shall be resolved in the applicable state or federal courts of Kentucky. The parties consent to the jurisdiction of such courts, agree to accept service of process by mail, and waive any jurisdictional or venue defenses otherwise available.